A truly wonderful dessert. Not without a few calories and other drawbacks, but once in a while very nice! Preheat the oven to 425 F. Spread the butter over the base of a 7 inch heavy-based cake pan or an ovenproof omelet pan. Spread the sugar evenly over the bottom of the pan. Scatter the cardamom seeds over the sugar. On a floured surface, roll out the pastry to a circle slightly larger than the pan. Prick the pastry lightly, support it on a cookie sheet and chill. Peel the pears, cut in half lengthwise and cut out the cores. Arrange the pears, rounded side down, on the butter and sugar. Set the cake pan or omelet pan over a medium heat until the sugar melts and begins to bubble with the butter and juice from the pears. in any areas are browning more than others, move the pan, but do not stir. As soon as the sugar has caramelized remove the pan carefully from the heat. place the pastry on top, tucking the edges down the sides of the pan. Transfer to the oven and bake for 25 minutes until the pastry is well risen and golden. Leave the tart in the tin or pan for 2-3 minutes until the juices have stopped bubbling. Invert the pan over a plate. It may be necessary to slide a spatula underneath the pears to loosen them. Serve the tart warm with whipped cream or vanilla ice cream. A very heavy pan is necessary as is a lower temperature while caramalizing the sugar. 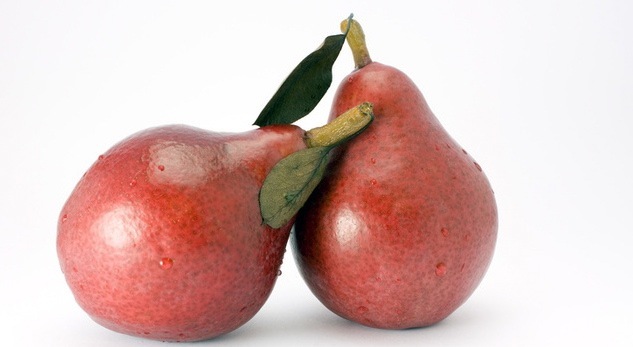 Choose fairly large, round pears rather than the more elongated varieties. Use a mortar and pestel to break about half of the cardamom seeds for a more intense flavour. My version from The encyclopedia of herbs and spices.